Sometimes you find you need a new piece of equipment in rocketry, because what you have isn't the right piece for a particular rocket. Or maybe you want an extra this or that. Launch pads are one of those - maybe you want to be able to set up multiple rockets at one time, or you need a pad with a fatter launch rod. If you go with building Estes kits, and you build a larger rocket with an E-sized motor, the kit instructions tell you to launch it only on an Estes E-sized launch pad. The basic launch kit has a 1/8 inch rod. Rockets with an E motor really should be launched with a 3/16 inch rod. and needs a larger launch rod than your typical Estes Skill Level 1 kit. Great, you think, now I gotta go out and get a whole new launch pad! There are a lot of things you can build yourself in rocketry - most things, in fact, once you get enough experience and know how things work. Launch pads are particularly easy. I realized I needed a launch pad with a 1/4 inch launch rod - and quickly, for a launch the next day. For most of my rockets, I use a camera tripod with the Odd'l Rockets Adeptor - a kind of threaded rod connector with a thumbscrew in the side. You screw one end of the Adeptor to the tripod, stick the launch rod in the top, and use the thumbscrew to secure the rod in place. It's great! And only about 10 bucks from JonRocket.com. However, it only takes up to a 3/16 inch rod. No problem! I threw together a little list, ran to Lowe's and Michael's Crafts - I needed to go anyway - and built a new launch pad. Whole thing took me 15-20 minutes to build, plus an hour to allow some glue to dry. There are a lot of cool launch pad plans on the internet - with legs, adjustable rod holes, swivels for changing the angle of the rod. But if you just need something basic, this works great. It only takes one sized rod, but you can make multiples of these for different sized rods, easily and quickly. Here's how you build mine. You can design your own - it just needs to be wide enough to be stable, and thick enough to hold the launch rod securely. I designed this on the fly, and it's really easy. While the glue dries, it's time to clean up the launch rod. The steel rod is found in a section labeled "metal shapes and rods," and I think it's for welding or something. I don't know - I only use it for rockets. In the same section, you'll find aluminum angle - useful for lots of applications in rocket building. For this pad, I used a 1/4 inch rod, but you should get whatever thickness rod you need. For your basic kits, a 1/8 inch rod is standard. Just make sure it's long enough - a 3 foot rod is right for most low power kits with A-C motors. I have a 3/16 inch rod which is 4 feet long for slightly bigger stuff. Note: I do have to get a longer launch rod for this pad - the rocket I built it for needs a 4-foot-long rod, and all they had in stock that day were 3-foot. Easy fix. The rod is covered with some nasty black oils, and may be a little rusty. This is fine. Just make sure you get the straightest rod you can find - some of them are a little bent. The rod is covered in oils which will turn your hands black, and may be a little rusty. You'll need to remove the label. First, you remove the paper label on one end of the rod. Then you'll get out some steel wool, paper towels and a can of WD-40. You're going to rub the rust and oils off the rod with the steel wool. Work from one end to the other - this doesn't take too long, but you want to scour the rod until it looks shinier. It took me perhaps five minutes. Now the rod is shinier and smoother. After that, you need to clean the rod. Spray some WD-40 onto one paper towel, and begin rubbing down the rod. All the oils and steel shavings will be collected onto the paper towels - it gets pretty messy. Once one paper towel is thoroughly dirty, switch to a new one. Spray on some more WD-40 and repeat the process. You'll repeat this a couple of times with a new towel until the towel remains clean, and doesn't show any oils when you rub it down with the WD-40. Finally, with a clean, dry paper towel, rub off the excess WD-40. Just rub the rod down until it doesn't feel greasy any more. Now, let's go back to the base of the launch pad. Take the book off the top, and with a pencil and straightedge, extend the diagonal lines from the corners of the wooden plaque so that you find its center. With a hand drill, drill as straight as you can down into the center, through the block and a little into the base. If you have access to a drill press, that's even better. I do not, so I had to eyeball it. Check the fit of the launch rod. It should go right into the hole. Then, see how easily it comes out. If it comes out too easily, just drill a little deeper into the base - but not all the way through. That will provide more friction against the launch rod, so it doesn't accidentally pop out of the hole at launch. The electric box cover serves as your blast deflector. If it's large enough, you can drill a hole in the center, and it will be perfectly centered on your launch pad. But mine came with a screw hole on one corner, which was perfect. Insert the launch rod into the hole on the base, and slide the blast deflector down over it. If you use a corner screw hole like I did, then it will hang off at an angle - this is great. It'll direct the blast away from the pad, and not just back up at the rocket. Just make sure you place your rocket over the blast deflector when you launch! Boom. You're done. Launch pad. If you need to angle the pad at launch, or you didn't get the center hole perfectly straight, you can adjust the angle of the pad by placing a small rock underneath one side. I've been meaning, for some time, to write an introduction to motor basics for any rocket n00bs who check out this blog, but I've been putting it off. Well, I'm glad I did, because I've learned something new which will affect some of the information in this post. That said, here are the basic basics of rocket motors for beginners. 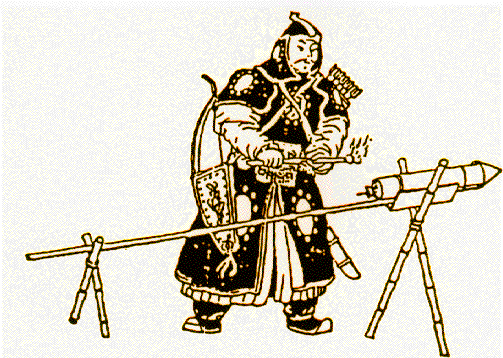 Your basic model rocket motor has a solid propellant made of black powder, a combustible material invented in China in about the 9th century C.E., and was used for fireworks and military weapons. 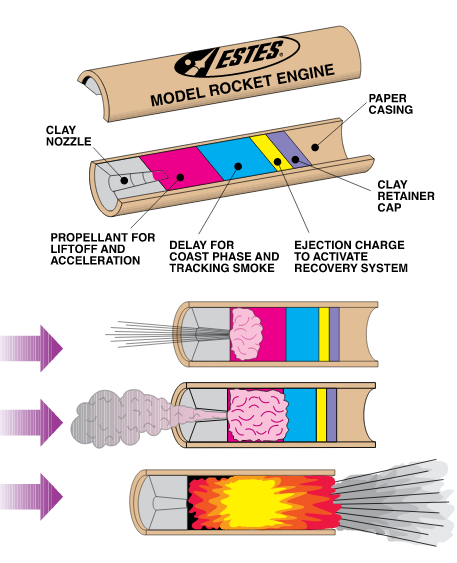 In a model rocket motor, the black powder is formed into a solid and pressed into a thick paper casing. At one end, you see a clay or "ceramic" nozzle - a plug with a little hole in it. At the other, you see a clay cap. If you read my posts on launching your first rocket, you know that the motor (or "engine" as Estes calls it) is inserted in the base of the rocket with the nozzle pointing out the back. An igniter is inserted into the nozzle and held in place with a plug or some tape, and then you hook up your launch controller and shoot the thing into the sky. But there are many sizes of rocket motors, and many levels of power. Newton's Third Law of Motion states that for every action, there must be an equal and opposite reaction. The First Law states that an object at rest will stay at rest, and an object in motion will stay in motion, unless acted upon by an external force. When the black powder motor is ignited, it combusts (it does not explode! ), creating an expanding mass of gas inside the motor, which presses on the walls of the motor. Now, if the motor were a sealed chamber, the pressure would be equal on all sides, and with enough pressure, the motor would explode! But remember, you have a hole - a nozzle - in the rear of the motor. As the expanding gas presses on the interior of the motor, it presses against the forward wall of the motor, and the forward wall presses back. Because the pressure at the nozzle end is lower than at the forward end, the pressure is unbalanced. So the gas escapes out the rear nozzle, and the rocket motor flies forward - carrying the rocket with it! All rocket motors and engines work this way. A lot of sources say that the exhaust shooting out the back of the motor are what propel the rocket forward. This isn't exactly true. It's not the simple act of the rocket exhaust flying backwards which makes the rocket go forward. The reason the rocket goes upward is that the gas inside the motor is pushing forward on it, and the gas flies out the nozzle because the rocket is pushing backward on it. Consider two people on skates, standing together. If one skates off in one direction, the other one will stay put. It's if they push on each other that they go off in opposite directions. This is action and reaction - both skaters are acting, and both are reacting. You could consider one skater the rocket, and the other skater the expanding exhaust gas. A typical black powder motor has three grains, or charges in it. The first, of course, is the propellant grain. This makes up most of the mass inside the motor, and as it burns, it creates thrust, propelling the rocket upward. This phase of rocket flight is known as powered flight. Once the propellant has burned out, the rocket continues coasting very far upward, and this is called the coasting phase of flight. At this time, the second grain, the delay grain or delay charge burns. It's a slow-burning chunk of black powder, which produces almost no thrust at all - certainly not enough to propel the rocket upward. While it creates no appreciable thrust, the delay grain does create a lot of smoke. This helps you to see the rocket (which can go very high and be hard to spot after a couple of seconds - especially a small rocket), so this phase is also sometimes called the tracking phase. The delay grain burns for several seconds, and when it's done, it ignites the ejection charge. This is a bit of loose black powder contained in the top of the motor just under the clay cap. The ejection charge creates a tiny explosion inside the body of the rocket. This is what causes the nose cone and parachute to eject - the charge creates increased air pressure inside the rocket so that the nose pops off. The parachute opens, the rocket floats gracefully to Earth, and you get to launch the rocket all over again with a new motor. You just remove the used one, pop a new one in, and do it all over again. Why Do You Need the Delay Grain? After the motor's thrust cuts out, the rocket will continue to coast upward for quite a ways. In fact, in most rockets, the coasting phase is much longer and gains much more altitude than the powered phase. Just think about throwing a ball straight up in the air - while it's in your hand, that's powered flight. But the ball doesn't stop when it leaves your hand - you can throw it much higher than your head. An image from JollyLogic.com, a manufacturer of model rocket altimeters. You can see from the illustration just how high a rocket can travel during the coasting phase alone. You want the parachute to deploy at or near apogee, the highest point in the rocket's flight. At that point, the rocket will have slowed down due to gravity and aerodynamic drag. It will begin to arc over and start falling straight downward. It's important for the recovery system to deploy when the rocket is going its slowest for two reasons. First, you want to get as much altitude out of a flight as possible. If the chute opens before the rocket is done coasting upward, the rocket will stop ascending and begin to descend, robbing you of altitude. Second, and perhaps more important, is that if the rocket is going too fast when the chute deploys, the force of the shock cord against the end of the body tube can damage the rocket. It can cause a kink in the tube, or worse - a zipper. A zipper is when the cord rips straight down through the body tube, causing a jagged tear. I've never had a zipper, but I have had the beginnings of one - on my first scratch built rocket, Janus I. If you get a kit, you'll see listed on the packaging a number of appropriate motors for that rocket. You'll probably see a list like A8-3, B4-4, B6-4 C6-3, C6-5. What does that mean? Rocket thrust is measured in newtons. A newton is a measure of force roughly equivalent to 0.10197 kilogram, or 0.2248 pound. Put another way, one pound of force is equal to about 4.448 newtons. Rocket motors are designated with a letter indicating their approximate total impulse, measured in newton-seconds, which could* be stated "newtons per second." This will tell you how much total force the motor will exert on the rocket, which will affect how high and how fast the rocket will fly. The total impulse is technically everything below the thrust curve. A thrust curve is a graphic illustration of the mathematical data describing the motor's performance. A thrust curve for an AeroTech F20 composite motor. Image from ThrustCurve.org. But a good approximation is to think of total impulse as the average thrust of the motor multiplied by the total burn time of the propellant - the total time the motor is burning and producing thrust. There is a little data in the thrust curve that this calculation won't account for, but it will give us a pretty good approximation, and it's easier to understand. 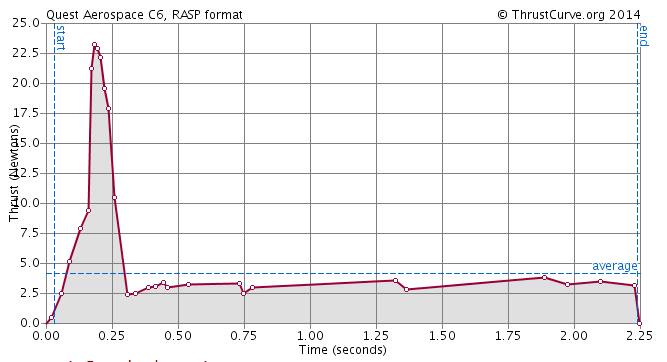 The total impulse (in red) of this motor is 51.8 newton-seconds. The average thrust (in green) is 20.8 newtons. 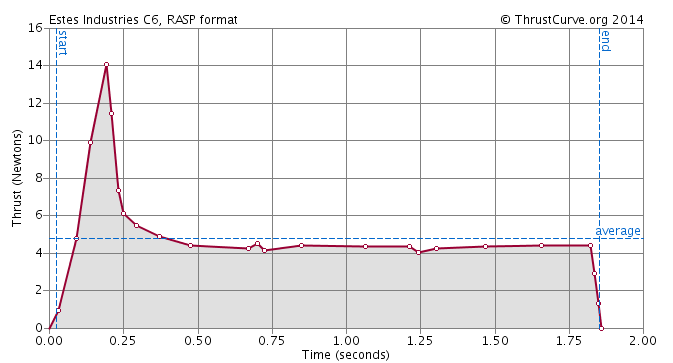 The burn time (in blue) for the motor is 2.5 seconds. If you multiply those, you get a total impulse of 52 newton-seconds - pretty close to the actual total impulse. *Remember when I said "newton-seconds could be stated as newtons per second?" Well, the reason that's not exactly correct is obvious if you look at the actual thrust curve - it's not even. It's curved. The motor's thrust peaks early, then tapers off. But it does mean that you get about so many newtons over the course of so many seconds, and that's what is meant by "newton-seconds." The classification starts with A (it can go down to 1/2 A and 1/4 A, but let's keep this as simple as we can) and goes up from there. Each successive letter class has a total impulse of up to twice that of the previous letter. An A motor has a total impulse of up to 2.5 newton-seconds (or n-s). A B has up to 5 n-s total impulse. A C goes up to 10 n-s, and a D up to 20 n-s. So the quick and dirty way of explaining it is that if you go up a letter class, you get up to twice the power as before. That's not all - if you have a cluster of two motors, or a multistage rocket, those motors add up - so a cluster of two B motors equal approximately 1 C motor. A multistage rocket with 2 C motors has the total impulse of a D motor. Model rockets (those not considered "high power" rockets, and therefore not restricted by the Federal Aviation Administration or the National Association of Rocketry) go up to G class (160 n-s of total impulse). Most F and G motors use composite propellant, which we'll discuss once I've had more experience with it. So, if you get yourself a pack of C6-5 motors, those motors will have a total impulse of up to 10 n-s.
We'll come back to this point in a bit. OK, this is where it gets tricky, and where the books get it wrong. Stick with me - we'll get through this. According to the rocketry literature, the letter indicates total impulse, the first number indicates average thrust of the motor, and the second number indicates the delay time. So, a C6-5 motor has a total impulse of 10 newton-seconds, an average thrust of 6 newtons, and a five second delay. Even Estes literature states this. That's so simple! But it isn't true. First of all, above I wrote that a C motor has up to 10 n-s of total impulse. It could have anything from 5.01 n-s all the way up to 10. Most of the lower power motors are close to the top of the scale, but probably none of them are right there. This is fine - when you learn about the letter designation of motors, you learn that there is a scale - and when you get up to higher impulse motors - say, E or F and beyond - there's a lot of variation. High power rocketeers talk of flying with a "middle H" or "low K" motor. With a bigger scale comes bigger variation. off the mark, but it's pretty close, as we'll see below. The first number, however, that's different. So, the problem isn't with the letter. It's that first number. Fortunately, we have a resource - ThrustCurve.org, created by master rocketeer John Coker. This website has thrust curve analyses of hundreds of motors - even the little black powder motors we as rocket n00bs use most. If you look up the Estes C6 motor (the delay isn't counted in the thrust curve), you'll see that it has 8.8 n-s of total impulse. Not bad - pretty close to 10. But if you look at the average thrust - that's where things go off the map. 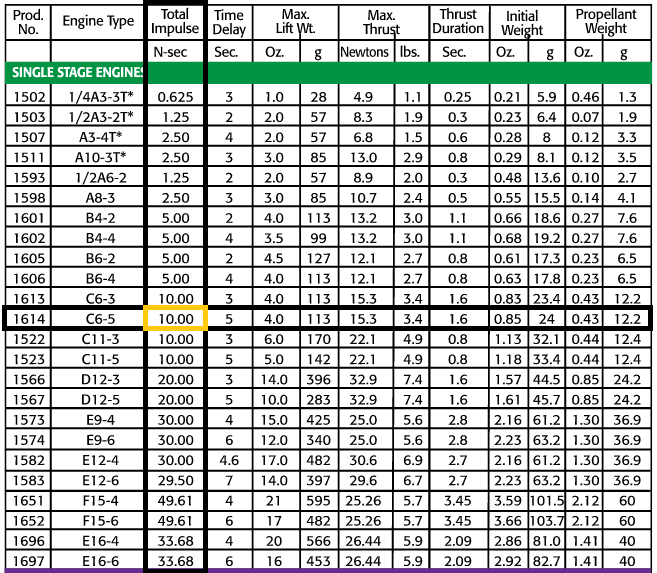 An Estes C6 motor has an average thrust of only 4.7 newtons - not close enough to 6 to say "about six." 4.7 does not equal 6. That's just basic math. 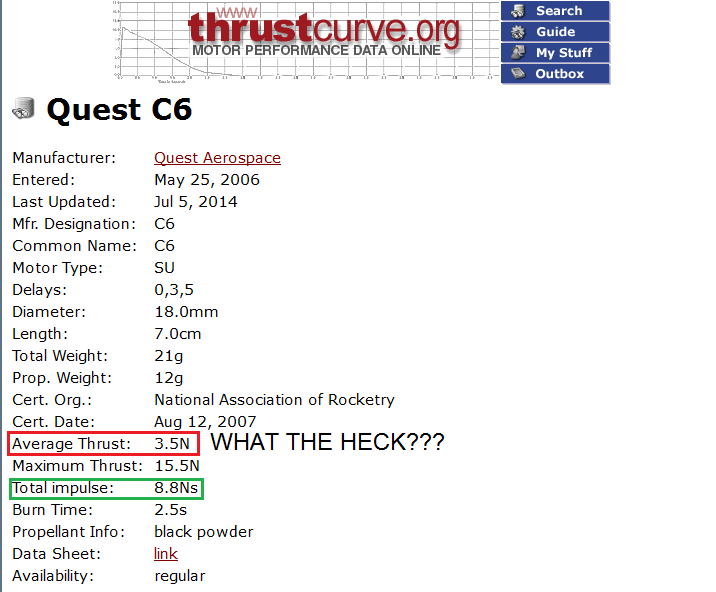 Now look at the info on the Quest C6 - 8.8 n-s of total impulse, but an average thrust of only 3.5 newtons! That's just over 50% of what you'd expect! Because of this, a rocket with an Estes C6 will perform quite differently than with a Quest C6. Thrust curves for the Estes and Quest C6 motors, respectively. Even a cursory glance at these shows they're quite different. When I first learned of all this, I found it a little frustrating, because the "official" meaning of the motor designation is so simple - 6 newtons of thrust. But the motors are in fact all over the map on this, making me wonder what the point of the first number even is. 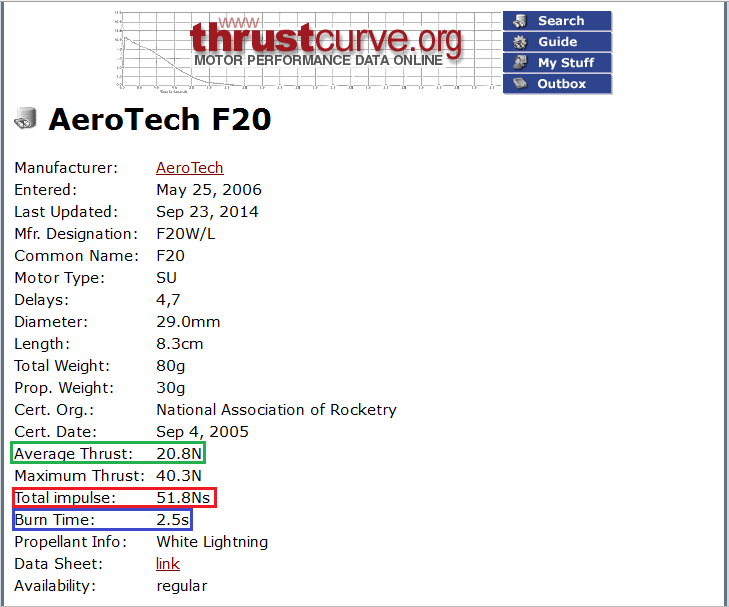 Look around at other motors on ThrustCurve.org - AeroTech, Cesaroni (CTI), all the other composites. The first number is in fact much closer to the actual average thrust, but none are exactly there. Once you get up into double and triple digits, the margin of error is minor, so I suppose it doesn't matter much. But why doesn't The Handbook address this issue? Why don't Estes and Quest simply use a number which is more reflective of the actual performance of the motor? I have yet to find an answer to these questions. Motor designations seem to be partly informative, and partly a matter of convention. 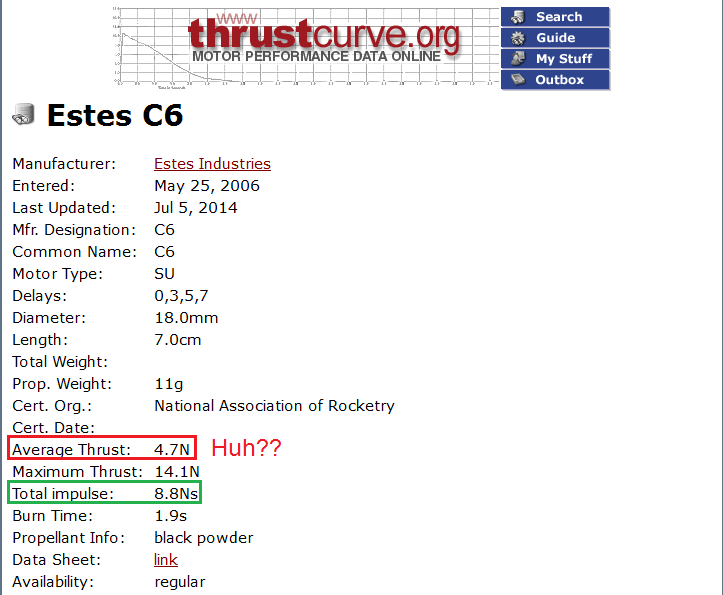 As John Coker wrote on a thread I posted on The Rocketry Forum, "A motor name like 'C6' is just that; the name." Which makes me wonder why they bother using a number at all, if it doesn't mean anything? Why not CRobert-5? BMelissa-4 and BJames-4? Now, there is one thing I'd consider to be an advantage to this. If the motor designations were straightforward, then a C6 motor would burn for about 1.666 seconds. In fact, an Estes C6 burns for 1.9 seconds, and a Quest for 2.5. That might seem like not much of a difference, when you're talking fractions of seconds, but powered flight is so quick that you do really notice a longer burn time. And powered flight is my favorite part of a launch. So, as long as the motor is strong enough to get the rocket off the pad safely, a longer flight with lower average thrust might actually be more fun to watch. Why the discrepancy? I don't know. I think a lot of the higher power motors - your AeroTechs, your Cesaronis - are closer in average thrust to that second number. And perhaps earlier Estes and Quest motors were closer to it, and the motor designation is a holdover from an earlier time. I want to be clear - I don't mean to disparage Estes or Quest here. I own a lot of Estes rockets and motors, and Quest rockets. And I love them, and will buy more. They work. 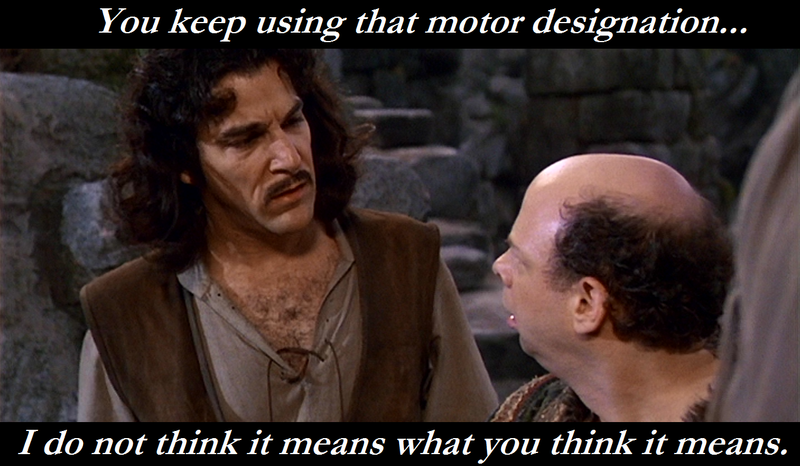 It's just that, if you read The Handbook and other sources, you're told that the motor designation means something very specific, but it's not the whole story. I alluded to this above, but here it is. The second number (B4-4, C6-5) is the delay time, measured in seconds. This number is more or less accurate - it will vary slightly from motor to motor due to slight irregularities in the black powder mixture, but it's pretty close. Most BP motors are sold with a number of delay times, and you want to select the ideal one for your rocket. Some rockets need a longer delay time than others, because once powered flight is over, they will coast further and for a longer period before reaching apogee and arcing over. I fly most of my rockets on a C6-5 motor most of the time, and this works great for most of them. The Big Bertha, on the other hand, is heavier and experiences much more drag than others, so it arcs over quite soon after the propellant burns out. When I put a C6-5 in it, it starts to dive toward the ground before the parachute deploys - it can make you really nervous when that happens. So I've switched over to C6-3 motors for the Bertha. 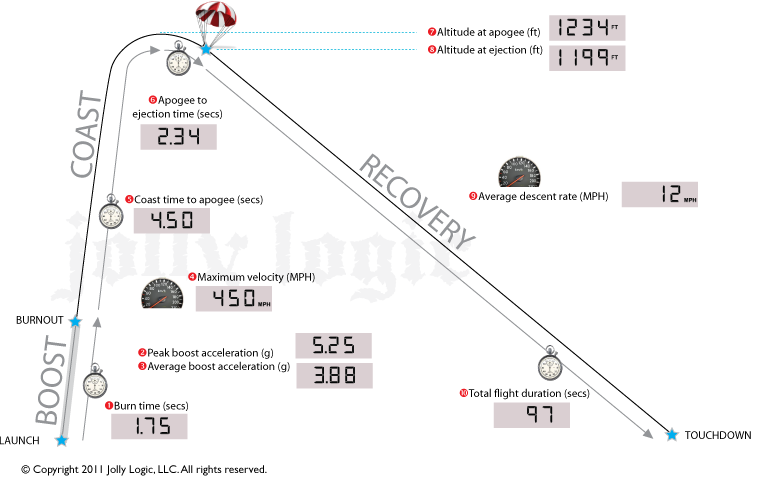 The motor performance is the same as a C6-5, but the parachute deploys closer to apogee. The Quadrunner, on the other hand, will coast quite far after powered flight - those four C6 motors put a lot of thrust on that rocket! With too short a delay, as we've seen above, the rocket could be damaged - and I put a lot of work into that one, as you may have read in a previous post. With that rocket, I use four C6-7 motors - a nice, 7-second delay. That means the rocket will fly for about 9 full seconds before the parachute deploys - a nice, long ascent! If you go with a kit, the proper motors with the proper delay times will be listed. If you need to pick one yourself, a rocket simulator such as OpenRocket or RockSim will help you. In my OpenRocket simulation, you can see the recovery device (parachute) deploys right at apogee - perfect! In the simulation I have an E9-6 (6-second delay) in the upper stage. The Optimum Delay for this flight is 6.12 seconds - that's pretty close to perfect for this rocket! What If the Second Number Is Zero? A rocket motor with a 0 at the end - such as C6-0 - has no delay charge and no ejection charge. There's no clay cap on the end. These are only for the lower booster stages of multistage rockets. When the propellant charge burns through to the top, flaming propellant shoots forward into the nozzle of another motor in the upper stages. black powder propellant inside. On the right is a C6-5 motor, showing the clay cap end. If you were to put a -0 motor into a single-stage rocket, the airframe would pressurize as soon as the propellant burned through, and you could get some severe damage to the rocket. So, save those motors for multistage use. We'll talk about staging at another time. Why Do I Need To Know All This?? Well, if you just by Estes kits and buy the motors recommended on the package, maybe you don't. But it's interesting. Learning new stuff is one of the fun parts of rocketry. And if you want to go further, it pays to know more. If you get a kit from another vendor, or a more advanced kit - like a mid or high power rocket - or if you decide to design your own, you should know more about motors, because you may have to decide for yourself what motors to put into your rocket. Looking at thrust curves will also show you what the peak thrust is, and when it happens. 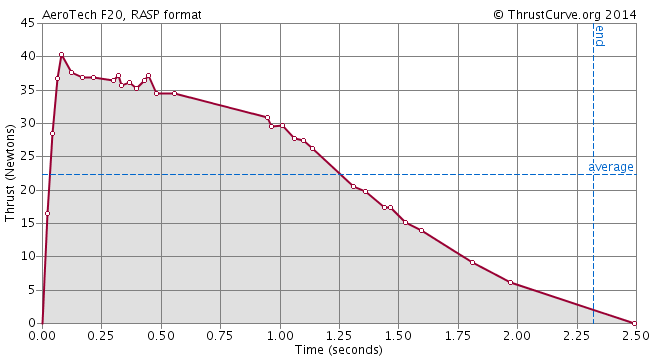 Peak thrust is that spike in the curve, and it's much stronger than the rest of the motor's thrust. This is often important for knowing if your rocket will be going fast enough when it leaves the launch pad to fly straight and true. There are a few ways of determining what motors are appropriate for your rocket. 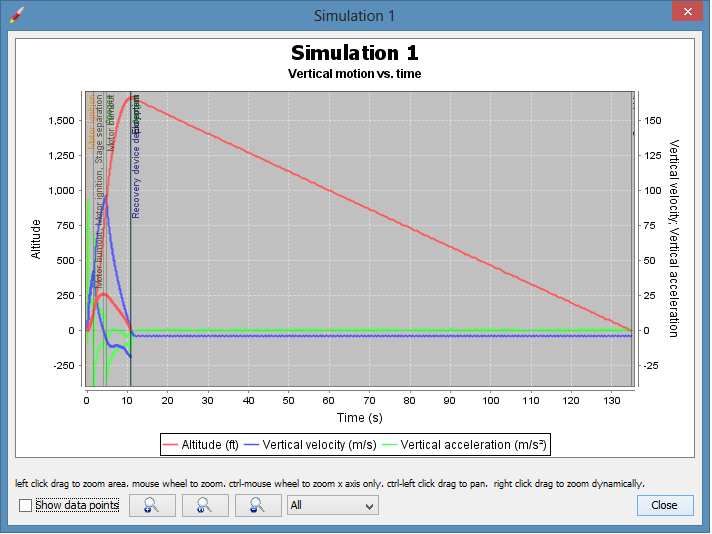 One is to use a rocket simulator, such as OpenRocket or RockSim, and try running simulations with many different motors. Or you can go to ThrustCurve and input information about your rocket, such as diameter, weight, and motor mount size, and ThrustCurve will give you a list of motors that will probably work for your rocket. Knowledge is power. Many newton-seconds of power. Note: I really enjoyed writing this post, and it took me quite a long time. It helped me realize just how much I've learned since I started. And it made me brush up on my basic physics. If any advanced rocketeers read this and notice I've left something out or made a huge mistake, please send me an email so I can edit the post and correct my mistakes! I've started building a new rocket, and it's a rocket I've built before - the Estes Cosmic Explorer, one of my favorite flyers in my fleet. Instead of doing the standard build, as the kit instructs, I'm doing my first kit bash. For rocket n00bs, a kit bash is when you take an existing rocket kit and modify it to achieve a desired effect. This could be any number of things - making the rocket shorter or longer, adding a payload section, adding things to the exterior to make it look different, or making it look more like a scale model - any number of things. In my case, I'm going to modify it so it takes a larger motor - in this case, an E-sized motor. into this kit. The one on the far right is the 24mm E motor which will go in this rocket when it's done. The standard motor for most kits of this size is 18mm in diameter and 2.75 inches long. An E is 24mm in diameter and 3.75 inches long. The rocket body is about 1.33 inch in diameter, just big enough to accommodate the larger motor size and still have a little space on the sides. This going back and forth between metric measurements and English measurements may seem confusing, but it's pretty common in American rocketry. Everything would be easier if it were all metric, I know, but most kits are sold with parts in fractions of inches. Motor diameter, however, is almost always stated in millimeters. Edit: It has been pointed out to me that what I'm doing here is not, technically, regarded as kitbashing. This is one of those things you won't really find in a dictionary, but depending on whom you ask, a kitbash can be simply modifying the model to perform differently than intended by the manufacturer (this is the definition you'll find on Urban Dictionary). But in model rocketry, kit bashing (it can be one word or two) is generally regarded as taking the parts of one kit and modifying them so that the result is a rocket which looks like a different, existing kit (the Wikipedia definition). Regardless, I want you to see how you can modify a kit to suit your needs, and that modification can be major or minor. Parts. Top row: two body tubes and a tube coupler. Middle row: Fins, nose cone, 18mm motor tube. very bottom is an errata correcting critical errors in the kit instructions. The rocket has an 18-inch long BT-55 airframe. BT-55 is the Estes standard measurement of a tube which is about 1.33 inches in diameter - its designation is now used by other rocketry companies as well. A tube coupler is a slightly narrower piece of paper tubing used to join two lengths of body tube to make a longer rocket. It gets glued with half its length inside both tubes. The fins have fin tabs on them. If you look at the aft body tube, it has slots in the base. This rocket has what's known as through-the-wall or TTW fins. They go through the wall of the airframe and are glued directly to the motor tube inside. You find this a lot in larger rockets, and it adds strength to the connection between the airframe and the fins - they're not likely to snap off on landing if they're TTW fins. The blue motor tube will be set aside and saved for another rocket. I'll replace that with a larger diameter tube. Because of this, of course, I'll need to trim those tabs on the fins - they're long enough to reach that narrower tube that comes with the kit, but too long if you have a wider tube inside - they'd stick outside the rocket! From the bag of stuff, I'll only use the parachute, shock cord and decals. The centering rings and motor hook are for a smaller motor, so I'll save those for something else. I'm replacing the 18mm BT-20 sized tube with a 24mm BT-50 tube. This, like all tubes, can be used for an actual airframe, but it's also the standard size for a D or E black powder motor. The tube, centering rings, and longer motor hook I bought at JonRocket.com - a great source for parts. Even if you're not building your own designs or hacking a kit as I'm doing here, it's good to have spare parts - to replace something that gets crushed in shipping or happens to be missing from a kit! When I built the Quest Quadrunner, this came in handy - it was missing two thrust rings! These go inside the motor tube to keep the motors from shooting out the top of the rocket! Fortunately, I'd purchased a twenty-pack of BT-20 thrust rings from JonRocket.com. The blue rings came with the kit - but I needed four! The brown rings came from JonRocket.com. Thankfully, many things in model rocketry are of a standard size. Estes ships kits in a cellophane bag you have to cut open, but Quest uses sturdy cardboard boxes which you can close again. To keep the parts safe while I take my time building this kit, I put the parts in the box in which the Quadrunner came. Just tape the label card from the kit you're building onto the old box, and you won't forget what's inside! I needed to cut the BT-50 to size - 3.75 inches long. When cutting a tube, it's a good idea to have something sturdy inside to support it, so you get a cleaner cut. I have a 4-inch long BT-50 coupler, so I slipped that inside. Tube couplers are quite useful things. Not only can they be used to join tubes to make longer rockets and support tubes as you cut them, I have used them to join scrap tube to rockets while painting them, to avoid getting overspray inside the tube. This turned out to be really important when building my two-stage rockets, because you join those temporarily together for flight - again, with a tube coupler - and having paint or primer inside makes the stages stick together. You can buy an assortment of tube couplers - and centering rings, tubes - all kinds of parts - on websites like JonRocket.com and balsamachining.com - another well-reputed rocketry supplier (but one I haven't used myself as yet). I like having a box of spare parts - then I can fix something, or spontaneously take on a project like this one. One of the few Estes accessories I really like - the tube cutting guide. These come in a number of standard tube sizes, and they go onto the tube and lock in place. They help you cut tubes cleanly, or mark a line around the circumference. The cut has been made - not perfect, but much cleaner than I'd have gotten doing it freehand. Above, you see the Estes Tube Cutting Guide in action - or, pre- and post-action. I wish I had a set of these in metal - they're great, but it is easy to accidentally shave off a bit of the plastic with a sharp hobby knife, leaving a jagged edge for next time. Because of this, I always use the blank side for cutting, and the side that says "Estes" and the BT-number for tracing lines around the tube. Next, I mark a line for the motor hook to be inserted, 1/4 inch from the end. Since the tube and motor are both 3.75 inches long, this means the motor will overhang the rocket by 1/4 inch. You use your hobby knife to cut a tiny slot there to insert the motor hook, just like we did in Part 3 of the Skill Level 1 series, Building the Big Bertha. A thrust ring for the 24mm motor tube also happens to be the same sized ring when you put an 18mm (BT-20) motor into a BT-50 rocket. You see how many of these tubes and rings have multiple applications? A rocket can be 24mm in diameter with a 18mm motor, or 18mm in diameter with a 13mm mini-motor. The tubes and rings serve multiple functions. Thrust ring - again, from JonRocket. Just like in the standard kit, you insert the end of the motor hook into the slot. I've marked a line on the tube where it'll be OK to tape down the hook. In many Estes kits, as in the Big Bertha, there is a Mylar ring which holds the hook in place. If you look at the fin tabs above, you'll see they have a little indentation to accommodate that Mylar ring. Since I'm using my own tube, I don't have a ring of that size. But tape works quite well - and it's thinner, so I don't need to worry about cutting an indentation into the fin tabs when I trim those down. Once the motor hook was in place, I glued in the thrust ring just above, or forward, of it. As with all my low power rockets, I'm using wood glue, because it's nice and strong. Put a ring of glue just inside the end of the tube where the hook was inserted, and place the ring inside. Press it down on a piece of wax paper on the table or cutting mat - this will make sure it goes in straight and evenly, and the wax paper prevents your getting glue on your work surface. Here's where I made a slight mistake, which we'll deal with later. In order to get a nice, tight fit, I marked on the motor tube where the fin tab should go - the idea was to get the centering rings right up to that line, so that the fins would be held in place not merely by the glue on the tab, but from the friction between the centering rings. I cut tiny slots in the centering rings to leave space for that motor hook, then glued them in place. I was only going to use two, but if you look closely at the picture below, you'll see that I damaged the forward ring slightly - the one to the left of the blue tape in the picture. To make up for that, and to add strength and make sure I got the motor tube well centered, I added a third ring. With a longer motor mount like this, and such narrow rings, it's probably not a bad idea. It's very common in high power rocketry - it adds strength to the whole mounting system. So I did it here. This camera tends to exaggerate perspective a little, but if you roll the motor mount across the table and it goes straight, your centering rings are straight enough. This kit will take me a while. I'm also starting my first mid power rocket - the Quest Big Dog. And I have a few longer, technical posts I'm working at for this blog. So this project won't be completed on this blog for a little bit. But I'll keep you updated, and of course I'll share the launch video with you!